Discussion in 'Bugs & Game errors' started by starshaped, Nov 9, 2018.
the Three day fiesta questline is bugged on faibrank and briscoe. 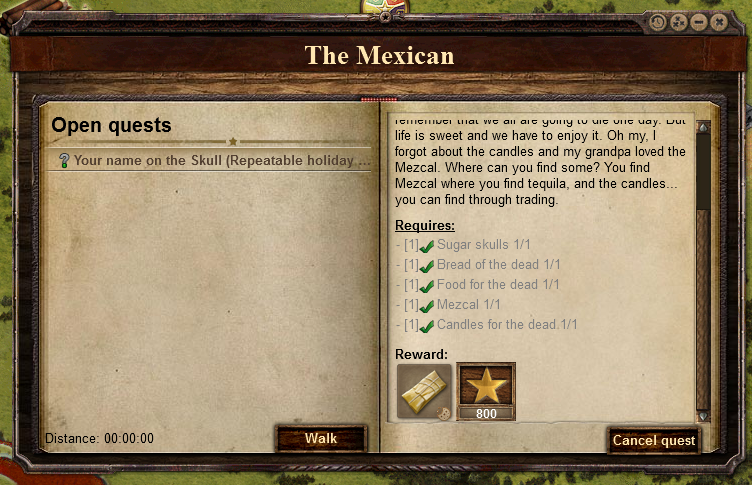 the final quest doesn't appear for me on briscoe & on fairbank the last 2 quests do not appear at the mexican. i've chatted with other players who are also having problems completing this questline. i reported this to support a couple of Days ago, but so far nothing has happened so i thought i'd better start a thread here so more players can see what's going on. any progress regarding this matter? we want our missing skill points & flowers that could give us bonds and/or dead hawk's set. We're working on a fix for this issue.